“The visiting fishermen all wore ganseys, which varied from area to area, with the Highland fishermen the most distinctive of all. They wore the Highland bonnet, which was similar to a Tam o’ Shanter, and their dress ganseys had a distinctive pattern knitted into them. Every fisherman had at least two kinds of gansey, one for working in and the other was a dress gansey for any social event, including the kirk. 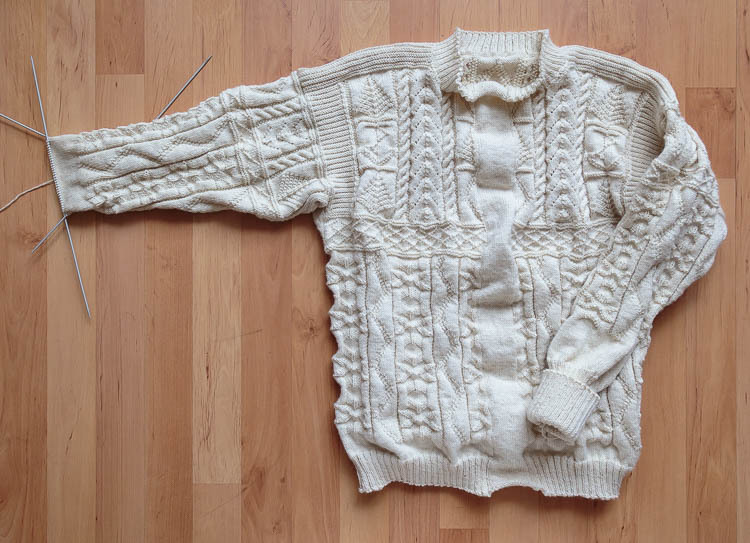 “The work ganseys were knitted round with thick wool, very plainly, and had no buttons on which a net could catch. The sleeves were knitted short and stopped in mid-forearm with deep cuffs down to just above the wrist to keep in the warmth and to prevent the chafing if the sleeves got wet. Similarly there was a deep midriff to grip the area around the kidneys and to keep their backs warm. The dress ganseys were where their wives really showed what they could do with knitting needles, and nearly every port had its own patterns which usually involved the Horn of Plenty, cable stitch, an anchorage, the shore, all knitted round on needles so fine that the knitting looked like weaving. 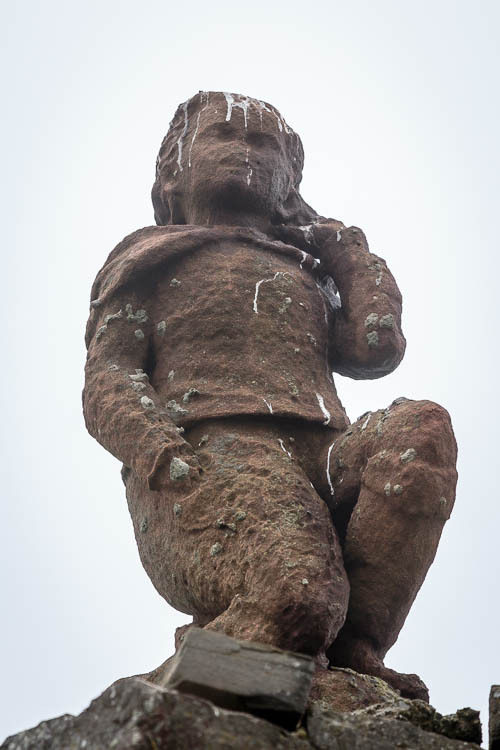 Mervyn’s Tower at Nybster – a gansey in stone? I hadn’t come across the information on buttons before, and, leaving aside the water-muddying reference to identifying drowned fishermen (let’s all agree not to go there), even if was only in part a “rule”, it shows that there’s always something more to gansey lore than one may think. With regard to the gansey cardigan, we had friends up for the weekend so I wasn’t quite able to get it finished: just a few more inches to go. The first step will be to get it washed and blocked, and after that—coming soon—the be-steekening! I wonder where Sutherland found the information on buttons. Did he footnote it? Hi Tamar, no, no footnotes, but Iain is an old “Wicker”, he’s in his seventies, has lived here all his life and has researched the fishing industry extensively and done lots of oral history recordings with local people (which he’s passed on to the Caithness Archives for posterity, bless him). I will ask him when I see him next, but I suspect this is either something he’s been told, or just as likely something he knew. This is one of the joys of working here—history isn’t just out of books! Fascinating on the buttons. I would be very interested in the author’s comments. It has seemed to me for a long time that all knitters do things slightly differently, and local groups develop a separate local outlook as well. So that if I were to go to a wool shop a hundred miles away, the choices on offer would be different to reflect local tastes and local techniques. I hope this makes reasonable sense. 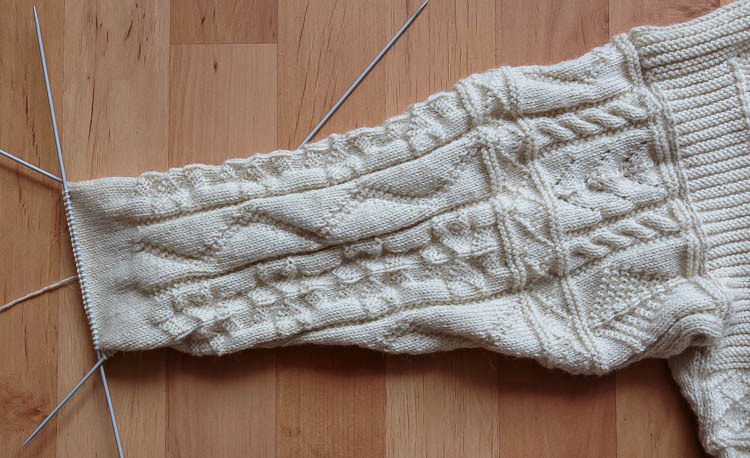 The gansey looks wonderful, I am looking forward to the finish of the knitting and then the cutting! Take care! Hi Jane, I’m sure you’re right, In the same way, as I’ve said before, I believe that’s how folk traditions evolve—one group see another group doing a dance, copy it, and over time it becomes something different, and so on. Another example would be the way Bob Dylan takes a traditional song and changes some of the lyrics to suit himself—people have been doing that for generations. The first rule of Gansey Club is— Well, actually it’s we all do whatever we feel like, and to hell with the rules! Thanks for sharing the history regarding the buttons, I had never read anything about that before and thought the buttons were just a ‘stylish’ embellishment when I saw them in old photos. Hi Lynne, interesting, isn’t it? In the interests of full disclosure I have to admit that I haven’t the first idea of how to add a button or a buttonhole to a gansey collar, but for the first time I’m beginning to think it might be worth exploring. Delightful button history tidbit on ganseys–I never thought that really mattered. If one needed some type of closure, the knitter would come up with one. Looking forward to the be-steekening! Handsome gansey, Gordon.